With the Orioles letting Fransisco Rodriguez walk and then being rumored to be looking to “shuffle the deck” in their bullpen, they’re primed for both signing and promotion to fill their bullpen needs. The only verbal commitment thus far has really been toward Jim Johnson, and even still who would be surprised if the O’s rid themselves of a 10.8 million dollar closer? They should have several vacancies that get filled internally. The Orioles have a tendency to have their most talented arms stretch out as starters before they convert them to relievers, and their current crop of top prospects is no exception so it wouldn’t be at all surprising to see either Kevin Gausman or Dylan Bundy filling a swingman role should they fail to crack the opening day rotation. 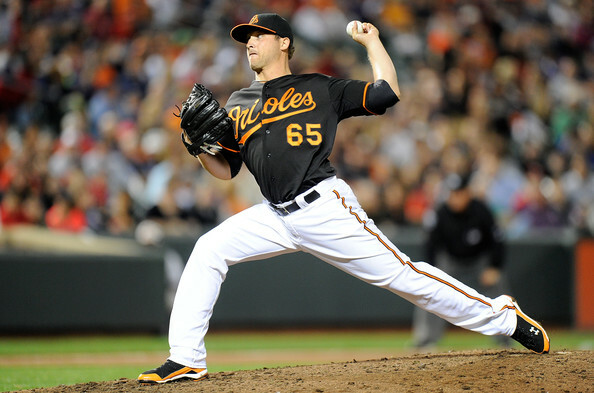 Josh Stinson or Zach Britton could also easily find themselves in the same role for the opposite reasons. They lack true relief prospects in the upper quality tier, though former Braves prospect Jairo Asencio may see a little more big league time if the need arises after he closed for Norfolk in AAA quite effectively all year despite a 2.1 IP blowup for the big league club. The prospect to watch in the Orioles system is Michael Belfiore. He made a 1.1 inning Big League debut that didn’t go so well (24.80 FIP) but remains a sleeper relief prospect all the same. Acquired from the Diamondbacks as the player to be named later in a trade for former prospect Josh Bell, Belfiore has been mostly excellent through his pro career whenever he was relieving. Marc Hulet sung his praises back when the O’s nabbed him originally and says the lefty possesses slightly above average velocity and is best utilized as a fastball-slider guy with a changeup and a curve that he can use to give hitters a different look. His control continued to take a step forward up to a little better than average with a 3.42 BB/9 in 76 innings at AAA this year, and his strikeout rate rose accordingly to a tidy 9.67 K/9. Even with nice numbers across the year (3.59 FIP, 3.18 ERA) Belfiore had a .351 BABIP which is sure to come down a bit due to an unsustainable .373 mark put up against him by right handed batters. Watch for him to be a lights out LOOGY at the very least in 2014, with the potential to shine against righties with a little better luck. Posted on November 21, 2013, in Bulls for the 'Pen, Orioles, Promotions and tagged Dylan Bundy, Jairo Asencio, Jim Johnson, Josh Bell, Josh Stinson, Kevin Gausman, Michael Belfiore, Zach Britton. Bookmark the permalink. Leave a comment.